What is Jardiance (Empagliflozin) used for? How should I use Jardiance (Empagliflozin)? Jardiance comes in a strip of 10 x 10mg tablets or a strip of 10 x 25mg tablets. The 10mg tablets are usually used as a daily starting dose. If it is well tolerated and further improvements are needed, the 25mg tablets can be taken daily. Jardiance can result in side effects. 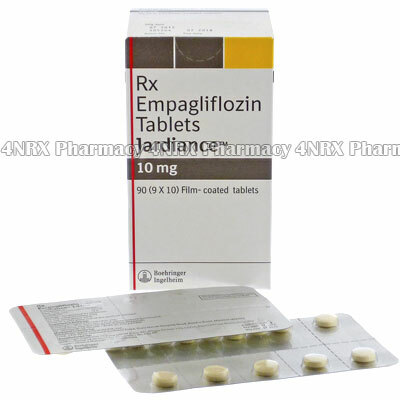 Some are serious and will require medical attention and possibly stopping treatment with Empagliflozin. Jardiance, when used with other medicines that can cause lower blood sugars (eg. sulfonylurea or insulin) can increase the risk of low blood sugar levels. Jardiance has been known to increase cholesterol levels in some patients. Pregnant women, women who are trying to become pregnant or women who are breastfeeding. If any of the above apply to you, check with your doctor before taking Jardiance (Empagliflozin).